I grew up in Glasgow in the 1970s and 80s, and my childhood was interwoven with my dad’s stories. In the photograph, my dad is the slightly grumpy looking boy. 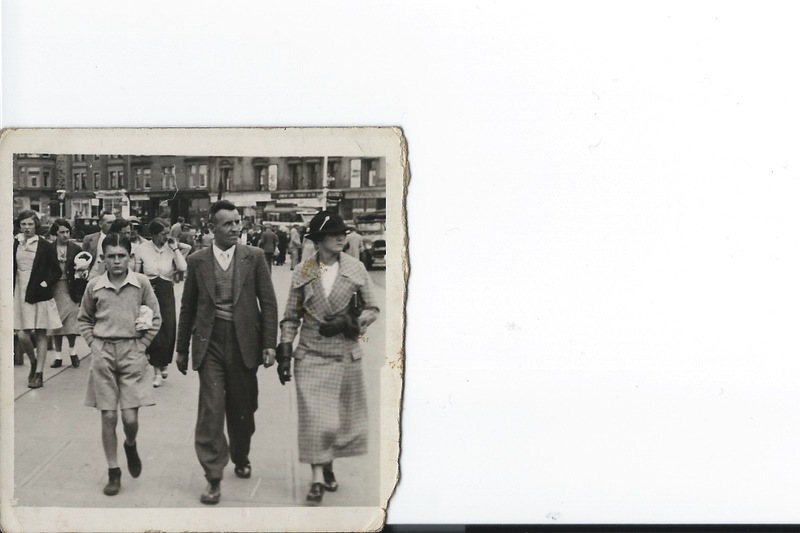 He’s just been swimming, and he is walking along a street in Coatbridge with his mother and father, my grandparents. I love this photo, because it was taken in another era, the 1930s. My dad really did grown up in another age. Dad was a storyteller, which meant that people would come round to our house to hear him tell his tales, and he loved to oblige. With a glass of whisky, he would sit by the gas fire and talk about the old days – providing the entertainment for the entire evening. Dad embellished the truth most of the time, but that made his stories even better. They began as anecdotes and over many tellings developed into epic, often heroic tales. His eyes would shine as he spoke. Every tale of course had its moral – its villains and heroes – even if the villain was the local dentist, pulling teeth without ceremony or anaesthetic. Often Dad himself was the hero, and when I was small and easily impressed I was immensely proud of his bravery and wisdom. I could not hear enough of his stories of the war (he put out incendiary fires on roof tops in London during the blitz, then served in Italy), or the old days in Coatbridge. His stories were the stuff of life and death, triumph or disaster. The stories were sometimes funny, sometimes tragic – dad’s voice would grow alternately loud and soft, emphasising the point and often repeating a phrase or a line that struck him as poignant or telling. He actually lived the stories as he told them. He got angry when anger was due, he laughed aloud or his eyes filled at the memories. The emotions thrilled through him as he spoke and when I was a child I felt them too. He forgave my distance, the years when I did not want to hear his stories because I was living my own. Going on my first date, out with friends, finding out who I thought I was. I must have passed him in the hall on my way out, and cut him short. “I’ve got to go,” I will have been impatient. I moved into a flat in the West End of Glasgow to be nearer to my social life. Once I set fire to my bed, and the first person I phoned after the Fire Brigade was Dad. We stood together after they’d gone, looking at the mess. “You’re a terrible girl,” he said. “I wish I could come down and just bring you home,” said Dad one time, when I was sounding a bit ‘down’ in a phone call home from London, where I’d moved for work. If he had turned up that night, I’d have packed my case and gone. My life would have taken a different path, everything would have turned out differently, but at that moment I would have gone with him. When I visited, I looked forward to hearing his stories. An evening would end with Dad and myself sitting up late, till the early hours, beside that gas fire in the front room. He would sit back in the chair, steeple his hands, close his eyes and it was as if he was calling the memories to him. Homesick for them, I didn’t mind at all that I’d heard them all before. They were comforting, like old friends. I remember though, one particular time I came home wanting to confide in him, to get his advice about a situation which was troubling me. He told five, six stories in a row and I began to feel restless for a real conversation. I thought to myself, how could he just talk at me like this? Can he not listen to me? A resentful little part of me thought that I would test to see how long he would talk before he realised that I hadn’t said a word. As I suspected, he was able to go on for quite some time. Eventually Dad stopped and he looked at me as if he was coming out of a dream, as if he saw me for the first time. “Is that the time? You shouldn’t have let me go on like that, you should have stopped me.” He looked genuinely stricken. And I felt terrible for having had such resentful thoughts. Still, while I had his attention, I told him what was bothering me. He thought long and hard, staring at the golden whisky in his tumbler, swilling it around. Then he sat back in his chair and told me another story. I got married. Mum and Dad were happy for me, although they will have known then that I would not be coming home to Glasgow. The week after my wedding, dad became ill. We had friends round for dinner, and we were all laughing about something stupid when the phone rang. I went into the hall and sat on the third step up. I sat on the stairs with the laughter still going on in the kitchen, and listened to Mum. “It’s cancer,” she said. He had to have a major operation, and he hated the hospital, he couldn’t wait to get out. “I feel like a bloody pincushion,” he said from between clenched teeth, when a nurse appeared with a syringe. The corners of his mouth were sore. He sucked cubes of ice. I didn’t want to know too much, and neither did Mum and Dad. We didn’t do the research. If we had, we would have known more than we wanted to. Instead we were just grateful as he gradually seemed to recover, and his hair grew back and we all carried on as normal. He saw two more grandchildren born and took genuine pleasure in my sister’s three boys. I noticed on my visits home that the whisky glass would be refilled more often. Little things annoyed him, like his stomach problems, the small indignities. But when he told his stories, he could forget it all and go back. He told us of the days when he was four and learnt to swear from the blacksmiths down the road, or when the town was shocked to find that the drunk they saw wandering the streets turned out to be a war hero and he was buried with military honours. I know that some stories were his and others borrowed and adapted, but it didn’t matter because they were wonderful and after all these years of adapting and honing and refining, they were a joy to hear. He had one of those warm, low Scottish voices. When I was little, I thought of it as ‘rumbly’ and I found it as comfortable as the warmest, softest blanket. If I shut my eyes, I can still hear it now. As he retold his tales, he entered other worlds, and forgot his illness and his discomfort. His stories helped him. “I think it’s back you know,” he told me on the phone one night, “They just can’t see it yet. I don’t mind. I’m ready now. I’ve had enough.” One night we had an extraordinary conversation which I will never forget. It lasted for over an hour. We talked about quantum physics and other dimensions and about how scientists don’t yet understand the nature of existence. Dad said that he didn’t know if there was anything else out there, but that if ‘this was it’, he was looking on it as the beginning of a big adventure. He was right, it was back and it was serious. They tried some new form of very aggressive chemotherapy, which could have bought him more time, but the treatment backfired. This meant that instead of weeks, he was left with only a matter of days. He was skeletally thin, sitting up in bed, with an angry red wound on his head from falling over and hitting his head a few days earlier. Myself, my mum and my sister and my eldest nephew, who was only seven, were by his hospital bed. “The gang’s all here!” said Dad. Pumped full of pain relief he was in good spirits, but he quickly tired. Mum stayed a little longer, and he said his last words to her, sweet words. He died that evening, just before visiting time. He slipped away five minutes before we arrived, and I could swear we passed him in the corridor. Dad never lived to see my two sons born, or my teen and children’s books published. I hope he’d be proud that his girl, who he sometimes jokingly claimed couldn’t even make a cup of tea, could get into print. Earlier this year I was visiting a library in Bromley for World Book Day, talking to classes from local schools about writing, and reading to them from ‘The Abominators’. Somebody asked me where I got my inspiration and, as I always do, I found myself telling them about Dad and his storytelling. I described how he could keep a room full of people entertained for an evening, and explained how it was better than television. But this time I went further. I asked the children if they would like to hear one of my dad’s stories. Now, whenever I go into schools to talk to children, and whenever I sit down to write a story, I remember his enthusiasm for and love of the spoken and written word. I want to pass that on. I hope that Dad would get a kick out of that. That if he was looking down, he’d approve. Because nobody loved stories more than he did.